Iraq faced mounting calls on Monday to release the journalist who hurled his shoes at George W. Bush, an action branded shameful by the government but hailed in the Arab world as an ideal parting gift to the unpopular US president. Colleagues of Muntazer al-Zaidi, who works for independent Iraqi television station Al-Baghdadia, said he "detested America" and had been plotting such an attack for months against the man who ordered the war on his country. Hundreds of Iraqis joined anti-US demonstrations to protest at Bush's farewell visit on Sunday to Iraq, which was plunged into a deadly insurgency and near civil war in the aftermath of the 2003 invasion. Zaidi jumped up as Bush was holding a press conference with Iraqi Prime Minister Nuri al-Maliki on Sunday, shouted "It is the farewell kiss, you dog" and threw two shoes at the US leader. The shoes missed after Bush ducked and Zaidi was wrestled to the ground by security guards. He is currently being held by the Iraqi authorities, a source in Maliki's office said without elaborating. But the government called for the channel to apologise, saying: "This action harms the reputation of Iraqi journalists and journalism in general." But young Iraqi woman Oum Mina said she didn't consider Zaidi a hero. "Bush is our enemy. But when you invite your enemy into your home, you don't treat him this way. This could destroy the image of Iraqis." Protestors in Sadr City, the bastion of radical anti-US cleric Moqtada al-Sadr, however, threw shoes at passing US military vehicles, while in the holy Shiite city of Najaf, the crowds chanted "Down with America." "All US soldiers who have used their shoes to humiliate Iraqis should be brought to justice, along with their US superiors, including Bush," said Ali Qeisi, head of a Jordan-based Iraqi rights group. An Iraqi lawyer said Zaidi risked a miminum of two years in prison if he is prosecuted for insulting a visiting head of state, but could face a 15-year term if he is charged with attempted murder. 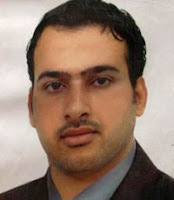 "We fear for his safety," said Muzhir al-Khafaji, programming director for the television channel, adding that Zaidi had been arrested before by the Americans and that there were fears that more of its 200 correspondents in Iraq would be detained. But in Libya, a charity headed by Moamer Kadhafi's daugher Aisha announced it was going to award Zaidi an "order of courage" for his actions. 'कभी सोचा भी है ऐ नज़्म-ए-कोहना के ख़ुदावन्दो! हिन्दुस्तान के पत्रकारों दो चार को जूते आप भी मारो . मजा आ गया, अगर लगती तो ज्यादा मजा आता, शेर दिल जवान है. अमेरिका को उस की ऒकात बता दी.